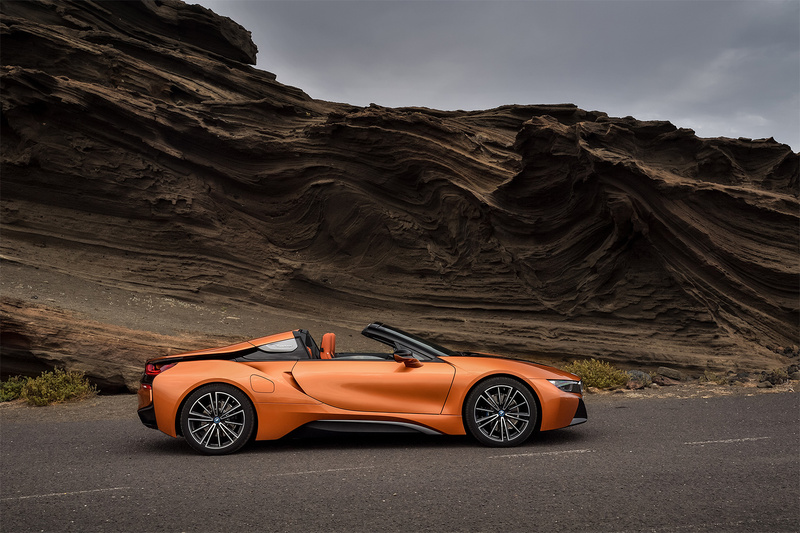 BMW unveiled its first-ever BMW i8 Roadster this week at the Los Angeles Auto Show. 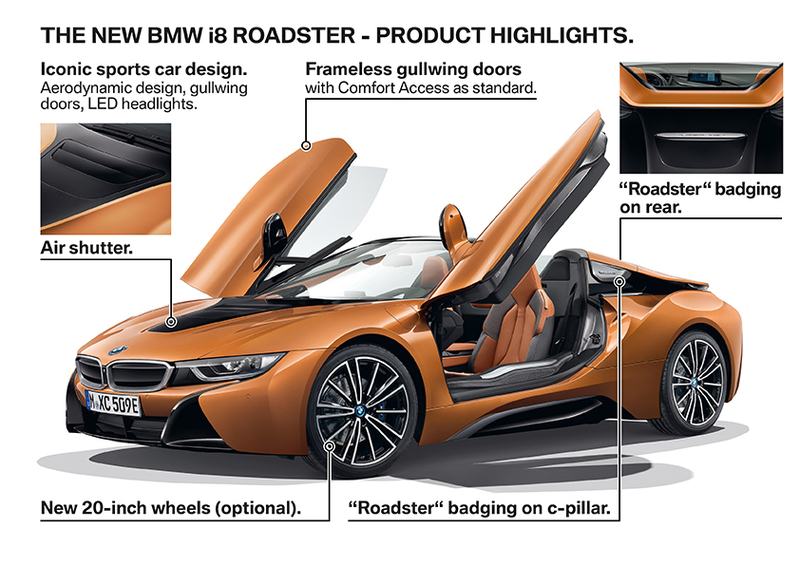 The i8 Roadster retains the Coupe’s show-stopping dihedral doors — with the top down and the doors up, this car will attract a lot of attention. 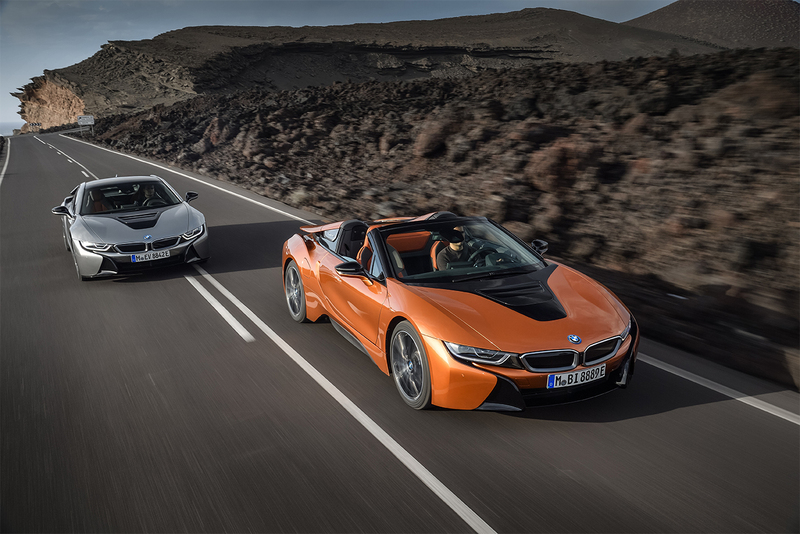 And deservedly so because the i8 Roadster takes the i8 Coupe to the next level by offering top down driving enjoyment, in near-silence, if you so choose. 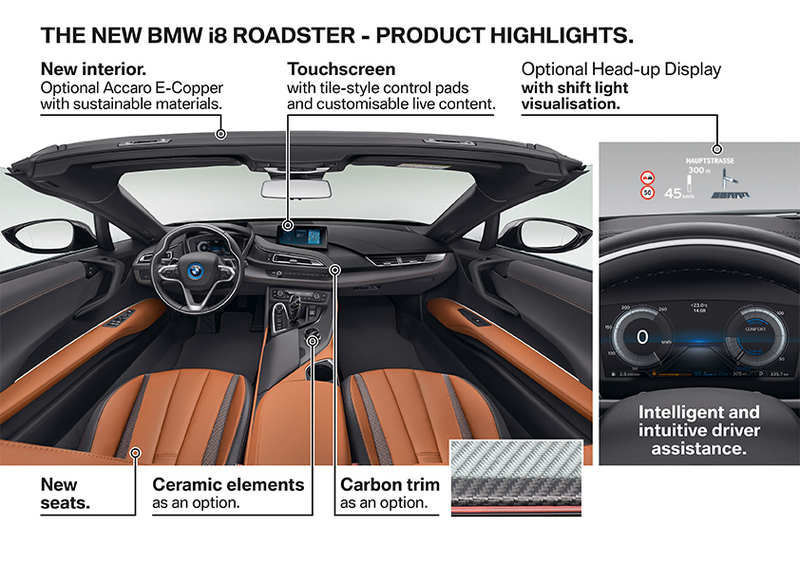 BMW’s updated eDrive technology powers both the i8 Roadster and Coupe. The car can now operate in electric-only mode in many more situations. While charge remains, the car’s 3-cylinder gasoline engine only fires up under hard acceleration and switches off more frequently. 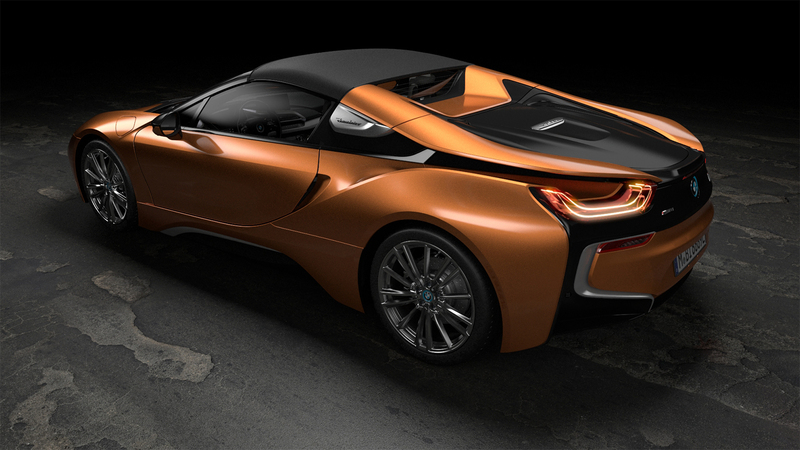 Underpinning its improved emission-free range is an updated version of the i8’s lithium-ion battery. The high-voltage unit is located centrally under the car, and its cell capacity is increased from 20 to 34Ah. All of this means that the motor has more energy at its disposal. Plus, the cell configuration ups peak output by 12 hp to 143 hp. 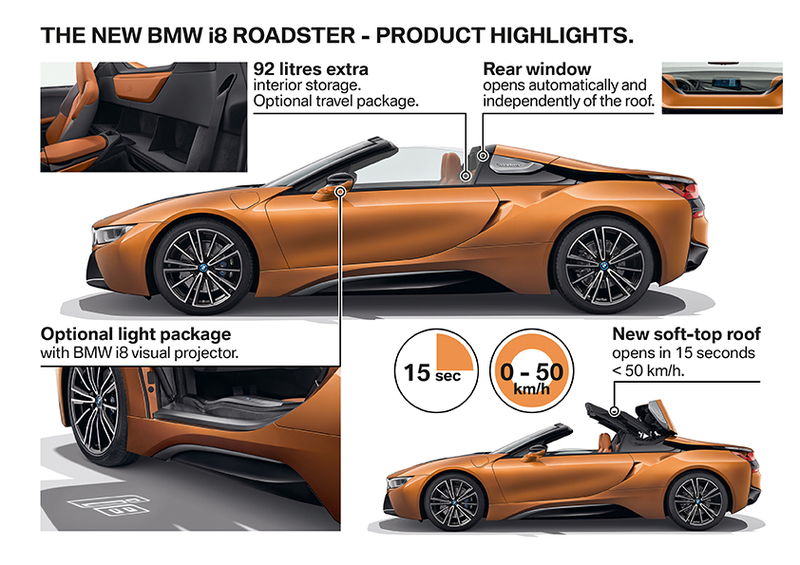 The improved technology means the i8 Roadster can cover up to 53 kms (33 miles) with zero emissions, while the i8 Coupé can achieve up to 55 kms (34 miles). The all-season fabric soft-top with soundproofing can raise and lower in 16 seconds at speeds up to 50 km/h (31 mph). 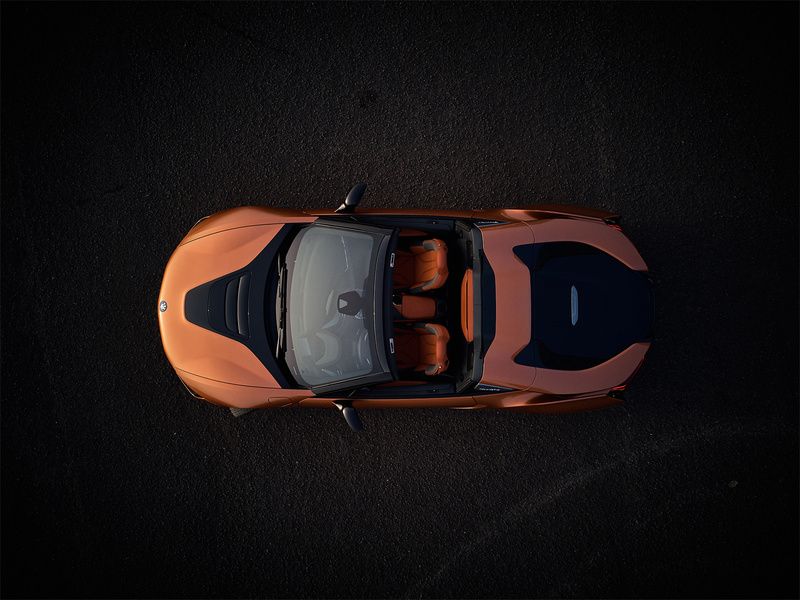 The i8 Roadster is unique in offering a fabric soft-top that stows into a perpendicular position in the rear when opened, taking up very little space. The three segments of the roof fold vertically in a Z-shape, leaving an additional 100 litres of storage space between the roof box and the seats, on top of the 88 litres of cargo space in the rear compartment. Opening the roof raises the rear window automatically by 30 mm, reducing air turbulence inside the cabin and ensuring passengers can enjoy the pleasure of open-top driving with minimal disturbance. The driver can adjust the height of the window and control airflow. BMW has added E-Copper metallic and Donington Grey metallic to the choice of exterior available colours. Both are combined with accents in Frozen Grey metallic. Customers can also select a new high-line ‘Accaro’ interior trim option, featuring cloth/leather upholstery in an Amido/E-Copper colour scheme. 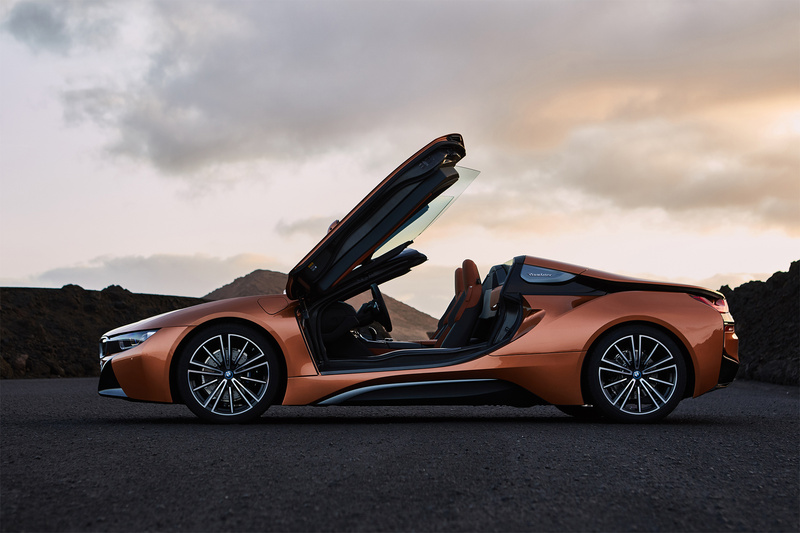 The i8 Roadster and Coupe are equipped with exclusive 20-inch light-alloy wheels in a W-spoke design. Each wheel weighs around one kilogram less than the lightest wheels previously available for the i8. Three other 20-inch wheel designs are available. 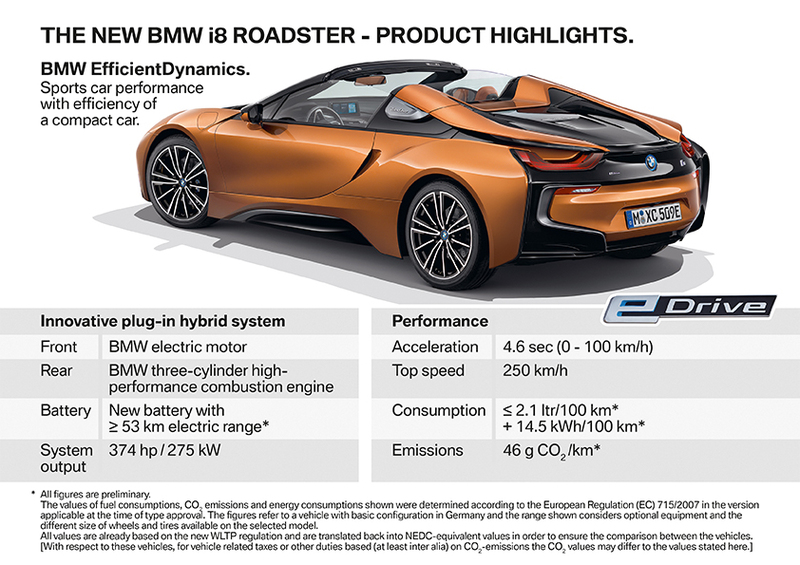 A hybrid synchronous electric motor and a three-cylinder gasoline engine with BMW TwinPower Turbo technology power the new BMW i8 Coupé and new BMW i8 Roadster. The engine feeds power to the rear wheels through a six-speed Steptronic transmission, while the electric motor powers the front wheels via a two-speed automatic gearbox. The end result is a hybrid-specific all-wheel-drive system. BMW has also improved the i8’s gas engine. The turbocharged three-cylinder engine featuring direct injection and VALVETRONIC variable valve timing extracts a maximum output of 231 hp from its displacement of just 1.5-litres, plus peak torque of 236 lb-ft. The engine is cleaner running and is equipped with a particulate filter that effectively absorbs all the particulate matter contained in the exhaust gases. 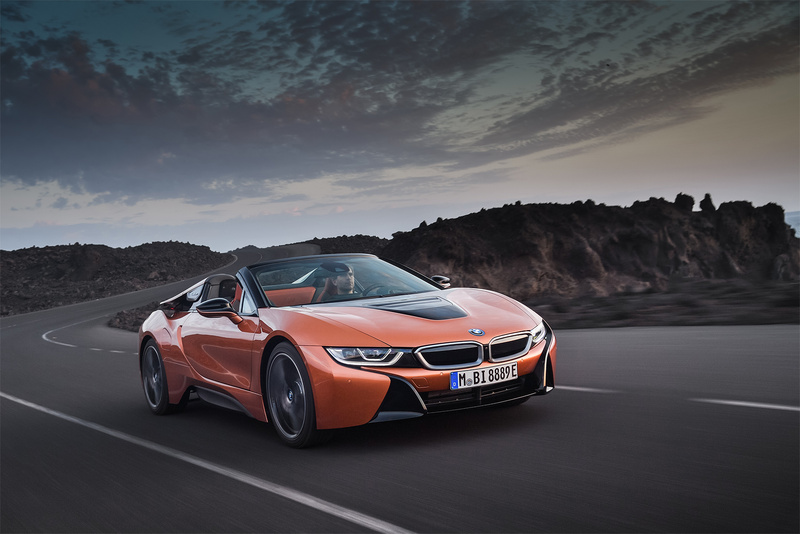 Acting together, the electric motor and gas engine increase the i8’s total power output to 374 hp. 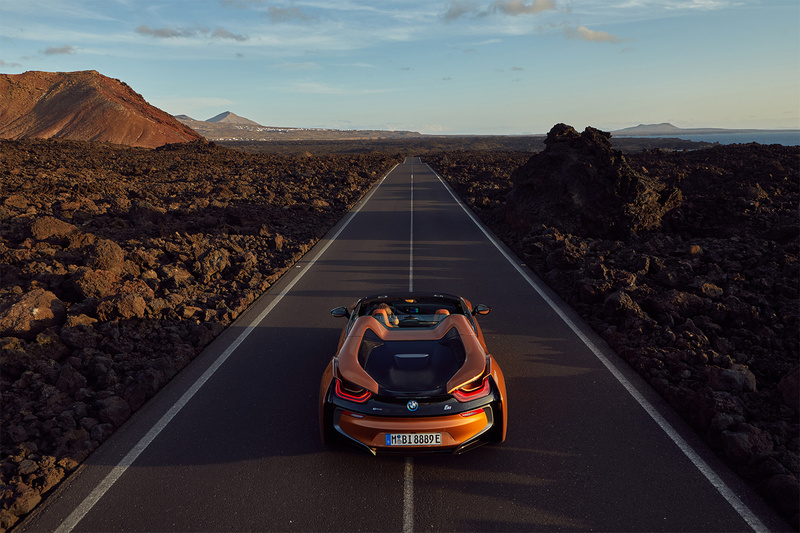 The new BMW i8 Coupé accelerates from zero to 100 km/h (62 mph) in 4.4 seconds, the i8 Roadster takes 4.6 seconds. Both models have an electronically limited top speed of 250 km/h (155 mph). 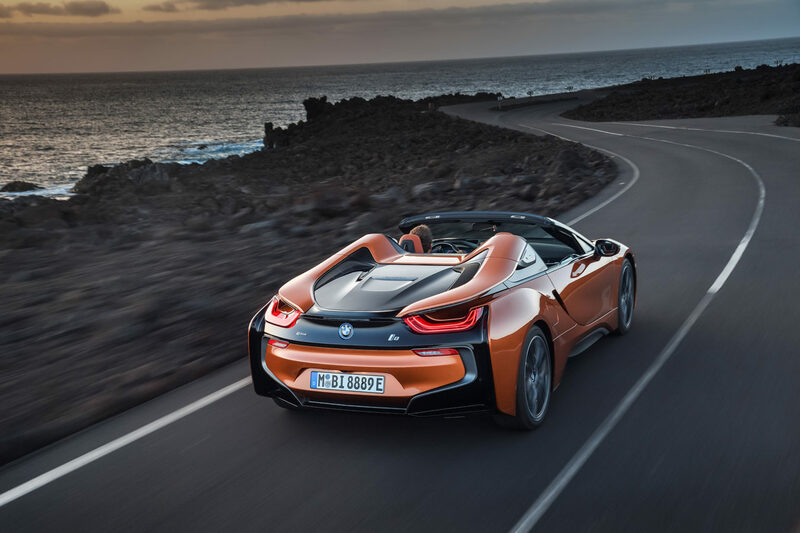 The i8 Coupe has become the best-selling hybrid sports car since its introduction in 2014. The i8 Roadster goes on sale in January 2018. Canadian pricing will be announced closer to market launch in Spring 2018. MSRP in Canada for the 2017 i8 Coupe is $149,900. November is the final month of production for the 2017 model. There will not be a 2018 model year i8.